This morning as I put on an old T-shirt for a run, I thought to myself, "There's got to be a good way to recycle these oversized old T-shirts" (you know the kind you get at races and any other function). And then I stumbled upon this today! 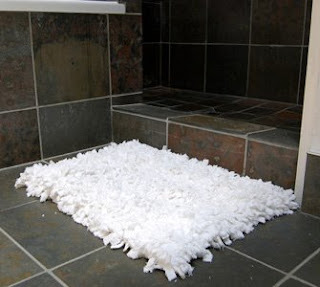 You can also use old towels. Brilliant! That's pretty cool. I like it. You got a lot more snow than we did. I like that onsie. I tried to buy that denim skirt for you for Christmas but I kept forgetting and then it was gone. I'm sorry! :( Also, we changed our blog to daveandpattiedwards.blogspot.com because the other was to complicated to tell people. love you!